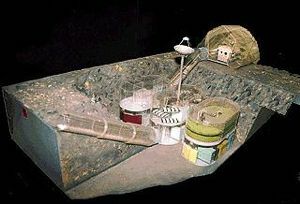 View of the DLB Soviet lunar base modules as they would appear deployed on the lunar surface. Russian manned lunar habitat. Cancelled 1974. Basic module developed by Barmin's OKB from 1962 for the Zvezda Lunar Base. Cancelled, together with the N1 booster, in 1974. AKA: Zvezda. Status: Cancelled 1974. Gross mass: 18,000 kg (39,000 lb). Height: 8.60 m (28.20 ft). Span: 3.30 m (10.80 ft). Barmin's lunar base would be crewed by nine cosmonauts and consist of nine modules. These modules would have a length of 4.5 m during launch and transport on the moon. Once position in place on the surface of the moon and inflated with air, they would telescope out to 8.6 m length with a total floor area of 22.2 square meters. Power would be provided by nuclear reactors. The nine modules would be pre-equipped in the factory for specialized functions: command module, laboratory/warehouse module, workshop module, midpoint module, medical/gymnasium module, galley module with dining room, and three living modules. A prototype of one of these modules was used in 1967 for a one-year closed-cycle living experiment at the IBMP (Institute for Bio-Medical Problems). Based on the results of this experiment it was planned that the units on the moon would have a false window, showing scenes of the Earth countryside that would change to correspond with the season back in Moscow. The exercise bicycle was equipped with a synchronized film projector, that allowed the cosmonaut to take a 'ride' out of Moscow with return. These psychological measures were felt important to maintain the crew's mental health. Family: Lunar Habitats, Moon. Country: Russia. Spacecraft: DLB Lunar Base. Launch Vehicles: N1, N1 1969. Agency: Barmin bureau. Bibliography: 291, 292, 89. View of DLB Soviet lunar base modules as they would appear in short transport configuration and in inflated, telescoped deployed configuration. Elements of Mars Train and Zvezda Lunar Base Support Craft. From left: two LK landers; Marsokhod with manipulator arms; Mars Train with reactor, ascent stage, and forward living module; another Marsokhod with manipulator arms. Zvezda Long-term Lunar Base (DLB) - . Nation: Russia. Related Persons: Korolev. Spacecraft Bus: DLB Lunar Base. Spacecraft: DLB Module. The N1 draft project of 1962 spoke of 'establishment of a lunar base and regular traffic between the earth and the moon'. Korolev raised the matter informally at tea with Chief Designer of rocket complexes Vladimir Pavlovich Barmin, head of GSKB SpetsMash (State Union Design Bureau of Special Machine-Building). 'You just design the base', Korolev assured him, 'and I'll figure out how to get it there'. Under the DLB studies SpetsMash defined purposes of the base, the principles of its construction, phases of its deployment and composition of its scientific and support equipment. The enthusiasts that worked on the project at Zvezda were naturally known as 'lunatics'.